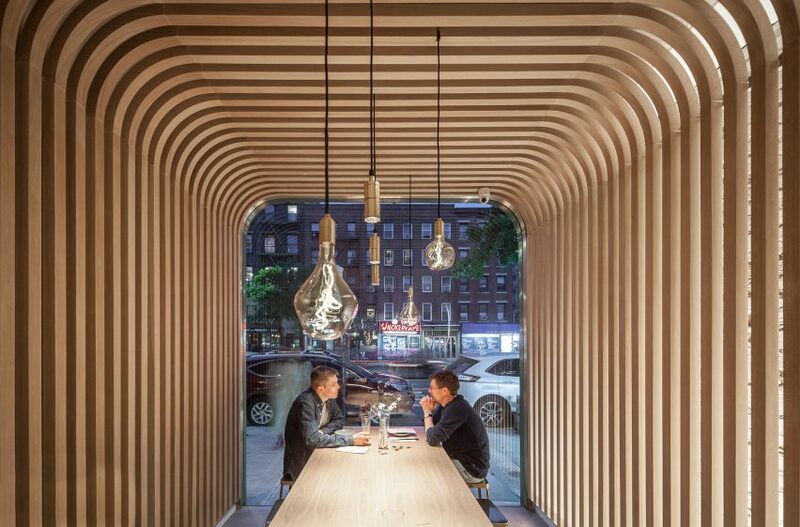 Curved slats of laminated wood cover the walls and ceiling of a Chinese restaurant in New York’s East Village by design firm New Practice Studio. 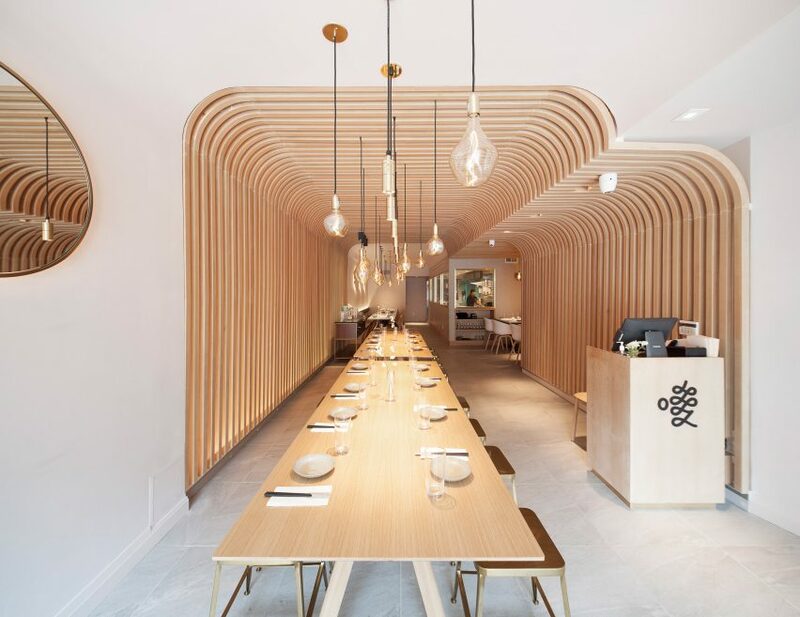 The restaurant was designed by New Practice Studio, a multidisciplinary firm with offices in Manhattan and Shanghai that was founded by architect Nianlai Zhong. 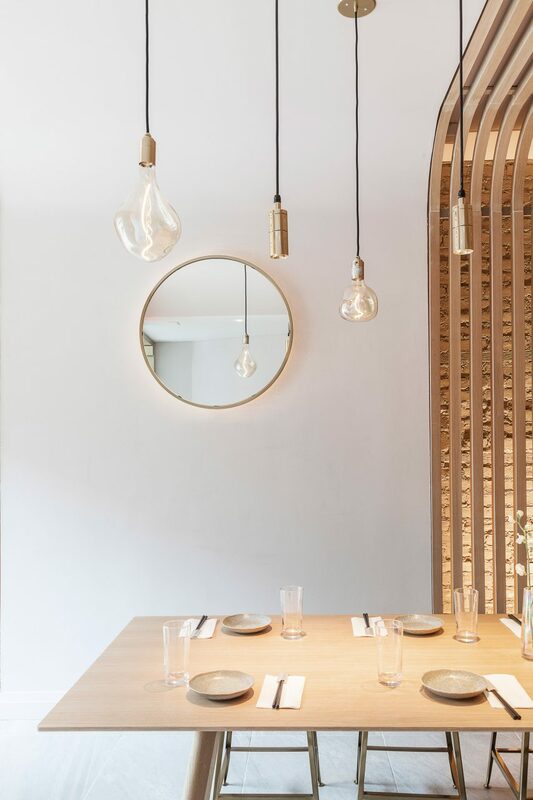 In addition to embodying the spirit of the cuisine, the space is intended to grab the attention of passers-by and allow diners to gaze outward. “The space is conceived as a place to look into and look out from,” said New Practice Studio in a project description. 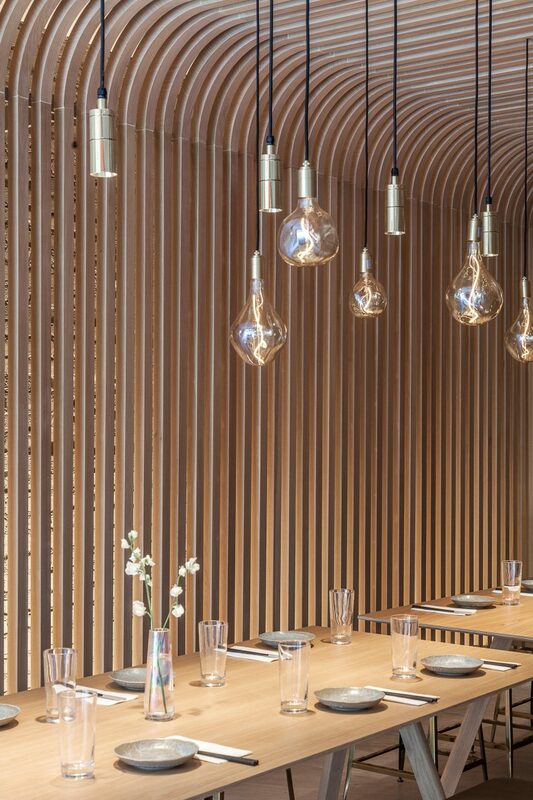 A signature element in the 3,000-square-foot (280-square-metre) restaurant is an arched, wooden screen that wraps the walls and ceiling, and is meant to evoke rice noodles. Fillet corners and carefully placed backlighting accentuate the screen, which is made of laminated wood with an oak veneer. The interplay between the thin wooden slats and white plastered walls helps create a “bright and warm atmosphere”, the team said. The restaurant has three distinct dining zones. In the centre is a pair of long communal tables made of plywood with an oak veneer, surrounded by brass stools. In the rear, there are two cosier seating areas with banquettes and marble-topped tables. Glazed walls around the kitchen allow diners to watch their food being prepared. An array of cylindrical and blob-shaped pendants are hung over tables, and circular mirrors add visual interest to bare white walls. In the front of the restaurant, guests encounter a wooden maitre d’ stand that features the restaurant’s logo. New restaurants pop up across the Big Apple almost every week. 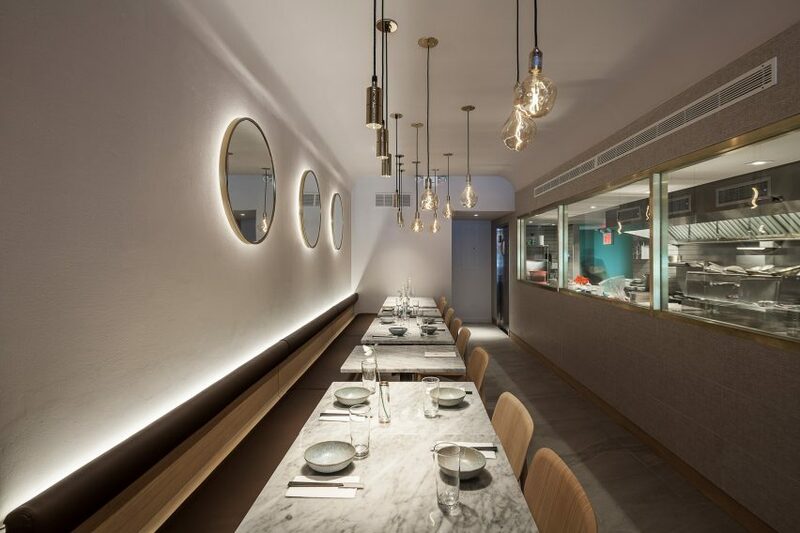 Others that have recently opened include the nautical-themed Summer Day Cafe by Savvy Studio in Tribeca, and the plant-filled Di An Di restaurant in Brooklyn by designer Huy Bui.